Most of the focus in all of the transport plans and policies released over recent months have understandably been on transport projects within the existing urban area. But over the coming three decades, billions will also be spent by the council and government to open up farmland in the North, Northwest and South for new homes and businesses. In total, these areas could see over 100 thousand new homes built over the next 30 years, that’s about two Hamilton’s worth. To support that growth, the Council/Auckland Transport and NZTA will need to build the strategic transport corridors. This means upgrades, extensions or new motorways, arterial roads and public transport infrastructure. Work has been done on this before, previously under the name Transport for Future Urban Growth (TFUG). Back in 2016 they came up with a preferred network as seen below. A lot has changed in the transport sphere since the project was first worked on. 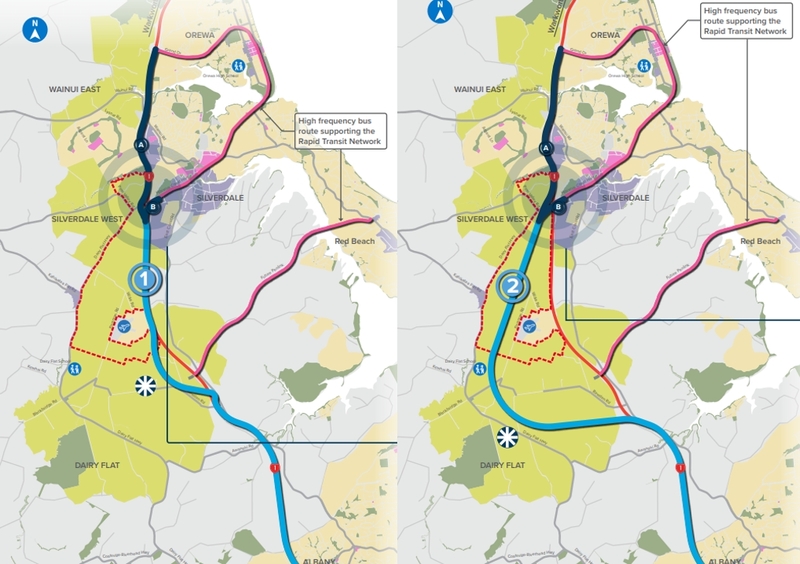 Drawing lines on a map isn’t enough and so a project alliance called Te Tupu Ngātahi has been set up to protect all of the routes that aren’t already underway separately, such as the Matakana Link Rd, Penlink and Mill Rd. That will mean going from a few high-level arrows to having a formal designation in the planning maps. Actually protecting routes long in advance makes sense and feels like something we haven’t done in a long time. Here’s Phil Tywford’s press release about it. 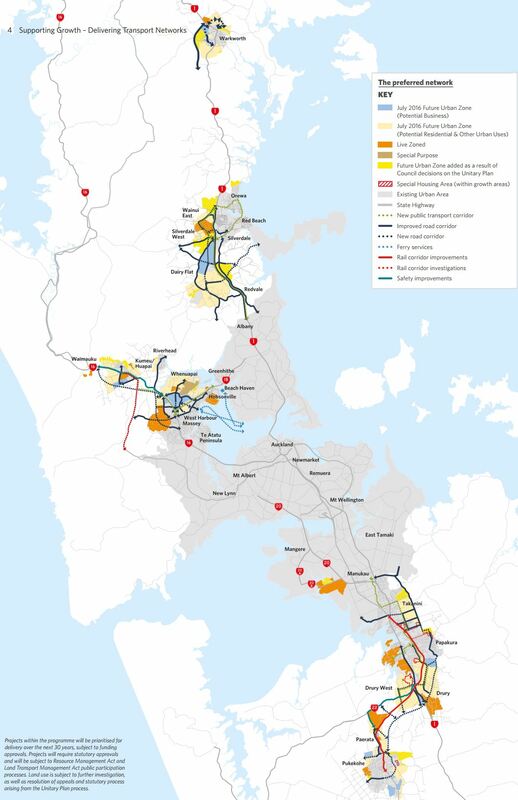 A new alliance is taking responsibility for planning and confirming around 60 transport projects to support growth in Auckland. The Regional Land Transport Programme sets aside $81.4 million over the next decade for this route protection work. Reviewing the preferred network is the stage they’re currently at and it’s good to see that as part of it they’re recognising the change in transport landscape as that occurred. This review is starting with Warkworth and the North Shore (the Dairy Flat to Silverdale corridor) and includes a public consultation. As well as new/upgraded roads, they’re also talking about how public transport can connect to Warkworth, including how developed a station is, how many there are and where they might be located. One of the more interesting discussions in the North is that they’re revisiting the options for the rapid transit route through the area. 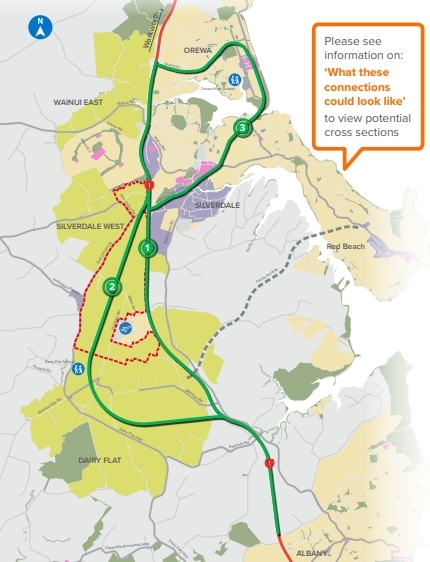 Does it stick next to the motorway for a faster and more direct service to Silverdale and Orewa or head inland to better serve the growing population at Dairy Flat before those areas further north. There is also the added question of if it reaches Orewa via SH1 and Grand Drive or via Hibiscus Coast Highway. As a quick estimation, option 2 adds about 3km to the route which would probably add about 5 minutes. But it’s not clear why the detour on it is so pronounced. It feels like that could be shaved down a bit so the time/directness difference wouldn’t be too different. In addition to the rapid transit options, they’re consulting on some high level strategic walking and cycling routes, which would link to local roads with cycle infrastructure. These seem to follow the same routes above. 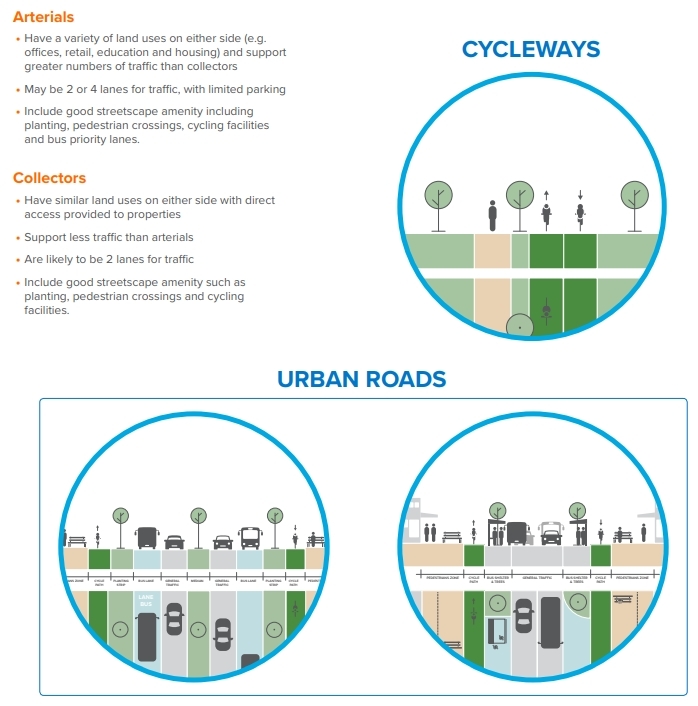 These are the types of cross sections they’re talking about for the arterial roads in both the North and Warkworth. There is more information about both areas on the Supporting Growth website. They also have some information days coming up. The Northwest and South areas will see consultations in coming months. Re: RTN north of Auckland — IMO the rapid transit should be as direct as possible. If that’s the SH corridor then so be it. We have to remember that this area is large enough to also support frequent services that can connect local areas to RTN stations. This strikes me as a situation where you don’t want to try and do everything with the one route: keep a clear distinction between rapid/frequent and patronage/coverage and the design follows fairly readily from there. Are the people of the North Auckland content to have parkway stations all the way to Warkworth (and eventually Wellsford)? There isn’t a single town centre within walking distance unless you count Smales Farm. The North West will get at least three: Pt Chevalier, Westgate and Kumeu, (probably Huapai and maybe Waimauku). Maybe automated vehicles will allow a techno-correction to this disconnection. Perhaps disconnection is what the North actually wants? Don’t visit us, we will visit you. The SH1 option is the seemingly easy option. It will be widened by two lanes Oteha Valley to Silverdale, so they will widen by four lanes and make half the RTN. The widening will be expensive for multiple reasons, so why not share costs? It’s not the optimal PT route for green field development, it’s merely a bit shorter and cheaper. Regarding the Dairy Flat RTN, it is critical that we think “big” about this. Apartments – tall ones and lots of them. And mixed-use. Like Singapore. Development that breaks the car-addiction will be more difficult if we expect people to incorporate feeder buses or private cars into their trips, only to then arrive at a bleak RTN station surrounded by hectares of park’n’ride facilities next to a motorway. That’s not shortening the trip or making it more pleasant. density compared to the 300,000ish who could be living in the future urban areas nearby. We keep thinking small…same development patterns spread further across greenfields with most people still driving to park & rides…we have enough of that already. We need to work backwards: What do 21st century high-rise-dwellers want? (walk 2 mins to the 200kph monorail via a great mainstreet.., bike paths through parks and cosmopolitan plazas…car share/uber for weekends…all the nice things that Albany and Westgate don’t have!). Sunnynook and Albany are both within walking distance of busway stations. The quality of the walk however….. I also agree the rapid transit line should be as direct and flat as possible if possible more so than sh1. It takes 5 years to procure the development, after that it then takes years of construction. It may take a decade to have infrastructure, and maybe two decades to have to have the housing community developed. By the time nobody knows will happen? Change in government direction and deferral of funding? Like what happens in the AMETI project. Indeed. By then we might have to be reducing our transport vkt or fuel might be very expensive. Perhaps there’s a better plan to be had. Given this is a greenfields development I think it is important the RTN goes through the middle of the urban area even if this increases the length of the route. This will allow for more transit oriented development around these new town centres. It’s worth noting the Western Line takes quite a winding route through the suburbs but is still very successful, no doubt in part due to having strong town centre anchors along the line, such as New Lynn and Henderson. Tend to agree but whats up with the FUZ zoning, why does this predominantly occur west of SH1. 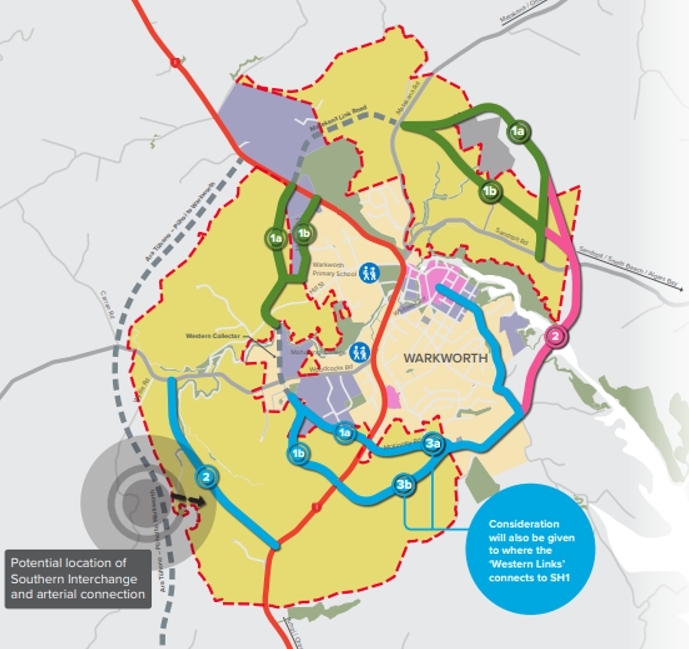 In another 30 years are we going have development on the east of SH1? Just seems to have a random shape at first glance. Massive environmental constraints to the east of the motorway I think. An extremely sensitive estuary and a huge desire to avoid urbanising its catchment. Reserved for Penlink. Apparently part of a future project to move Red Beach. There are good things about option 2. If option 2 use light rail with quiet tires on dedicated lane cruising at 80kmh, and have the cars moving at 50kmh and ban trucks. We could have a nice and quiet transit corridor with tree lined landscaped and cycle way. The surrounding would be very good. Cars moving at 100kmh making huge road noise can use the existing motorway 1. Light rail to Warkworth, that’s crazy, if rail goes to Warkworth it has to be heavy rail, which makes it all the more important that the Northern Busway is converted to heavy rail. The RTN absolutely has to go through the development, not around it. Coming 1km off of the motorway adds a geometric maximum of 2km to the route and allows us to build proper town centres. Otherwise we will have locals driving to Albany every time they want to buy something or have a night out. Dairy flat should have high rise residential around 3 stations and 0 stand alone houses. Really? You expect that density that far out? I expect that in 20 years time there’ll still be more PT demand originating from north of this location. I could be wrong. There is definitely demand for it. With LRT it would be as close to the city center as Manukau. That density should be allowed at every single RTN station. It is about 30 km, that is a similar distance as Almere to Amsterdam. Why not. Build a proper town in Dairy Flat. So it is worthwile to have a major PT node. And maybe we can design it for less than 100% of car mode share. And then maybe we don’t end up filling every square metre in between with free standing houses. Wow that Mahurangi Bridge looks like another Penlink. I think the pronounced shape of that detour is due to the hills just south of it.